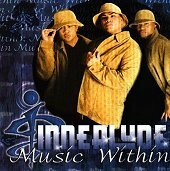 California's Innerlude is made up of three vocalists, two of them brothers and one of them a long-time friend. Though they incorporate rap, their main sound focuses around R&B/hip-hop grooves and plenty of dance pop to make you want to move. They can sing, which is a nice bonus in the world of dime-a-dozen artists in any given marketable style of music, and their songs are solid. The drum machine ticks while the rest of the rhythms are laid out in a deep, bold presentation perfect to drive around town blasting out of your car while everyone at the stoplight listens to you show off your car stereo. As you can see, I'm being a bit sarcastic about the status some people place on their stereo, but I'm not joking about the grooves and rhythms these guys lay down, which seem almost appropriate to test your stereo with. Since they can sing, they lead you through nineteen tracks of ballads, romanticism, and delicate vocals which work together to give you a very lovely, warming feeling. So, put this CD on, blast it loud, start to dance, or just enjoy the beauty that emanates from track to track. I'll give this a B+.